As always, I'm pretty excited about all the books I got in my mailbox this week! I've heard good things about the library books, and I'm super eager to start the ones from Netgalley! Looks like you got some totally great stuff. :) I loved Sisters Red, so I really want to get around to reading Sweetly at some point. Nice to see that this week was good to you. :) Have a great day! I read Wolfsbane and obviously liked it. Hope you enjoy it too. I got darker still as well! looks so good and I adore the cover. 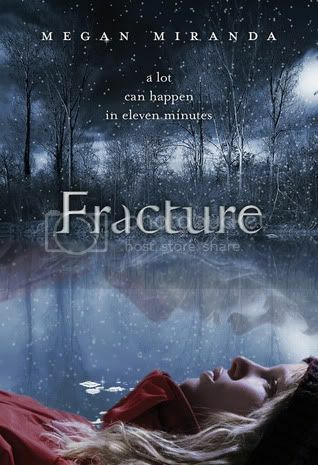 I also got a proof copy of fracture in the post today. Great mailbox! I so want Fracture as well. Great mailbox this week you got. I got some awesome books this weeks. Come visit me over at Livre De Amour-Books of Love Blog. Nice! I got Darker Still too! 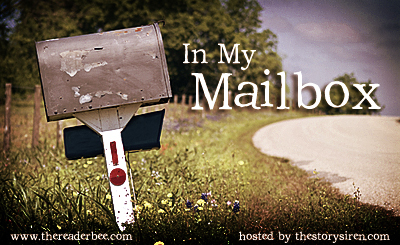 What's in my mailbox this week! I want to read Sweetly SOOO bad! Lovely week! Darker Still & Fracture look amazing. If I didn't already have a 100 books to read, I'd request them. lol. Enjoy! Mmm enjoy! I really liked Wolfsbane, though it IS a sequel so there are some of THOSE issues. Still, it was good. Have a good reading week! I didn't realise Darker Still was on Netgalley, I will need to have a look on Netgalley at some point today. Great mailbox this week. Oooh Fracture and Darker Still! Really excited to read both of those. I'm intrigued by the premise of The Vampire Stalker, sounds interesting. 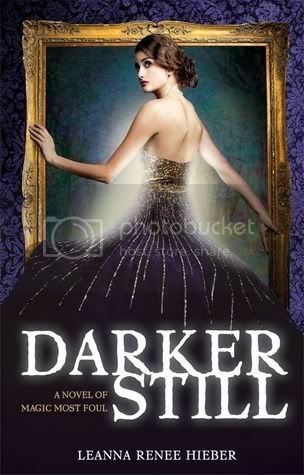 Darker Still has the most stunning cover! Gorgeous. That definitely caught my eye. Enjoy your books this week! Great mailbox!!! I wish it were mine :) Happy reading! Also, I am so excited to read Wolfsbane! The Vampire Stalker is cute, and fun. So many awesome books Christy. Enjoy! Great haul! I'M really curious about Sweetly. And great Dark Eden swag I loved that book! You can see my IMM post for this week at the link below- Happy Reading!! I have to admit that I still haven't read Nightshade, but I need to considering how much everyone has raved about it. I loved Sweetly and Wolfsbane. The frayed pages of Wolfsbane are the coolest! Hehe I picked up Darker Still off NG too.. it looks interesting! You've one great pile this week! Darker still is something I really want to catch, and Wolfsbane and Sweetly both look promising. Sweetly cover, for some reason, makes me think of The Wolves of Mercy Falls. Nothing alike, I know, but the style is somehow... reminiscent! Great mailbox! Wolfsbane was amazing! I read and reviewed it not too long ago. Haven't read Sweetly or The Vampire Stalker yet, though. I have Sisters Red checked out from the library at the moment, so I'm going to read that first and hope they have Sweetly in next time I go in, I don't think it's in the catalog yet. Darker Still and Fracture look good. 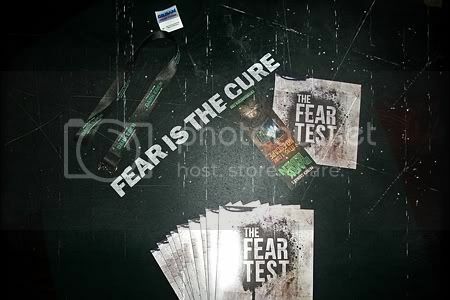 =) Cool swag! I'm really curious about Dark Eden now. I'll have to go check it out on Goodreads. The swag has my attention. How nice! I've been seeing Fracture around - and Wolfsbane too. Nice that you got several books from the library as well. Enjoy reading your loot for the week. I got Darker Still and Fracture as well. Someone was telling me yesterday that Darker Still is really good so I'm excited about reading it! Enjoy your books! SWEETLY! I still need to read this!! I want to read DARKER STILL! I'm so jealous of all the DARK EDEN swag everyone got! Wolfsbane is one of my favorites and I like the cover Darker Still. Great set! I really want to read Darker Still and Vampire Stalker. I hope you enjoy them. I just read Sweetly this week - creepy, but in a good way. I am going to have to add Darker Still to my reading list; I've seen it quite a few times today, and it looks like something I would enjoy. Great reads - enjoy them. Looking forward to your thoughts on Wolfsbane! Great stuff this week! 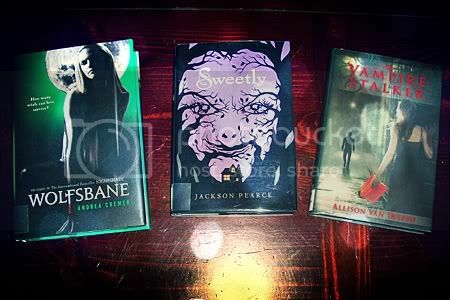 Fantastic collection :) I'm looking forward to reading Wolfsbane and Sweetly as well. Oh, the books you got this week is kinda macabre. Wolfsbane seem to be a good book. I like it! I haven't heard of Wolfsbane before - what's that one about? And I'm jealous your library has Sweetly already! That one sounds pretty interesting, although I do think the cover is very creepy! Oh you got some amazing books this week! Fracture and Darker Still are ones I'm so anxious to read. Netgalley is so awesome! I'm really curious to see what you think of The Vampire Stalker! Thanks for sharing! Wolfsbane was so fantastic. I really hope you enjoy it and your other books! Ooh, lots of paranormal in there! Enjoy all your new books! I haven't read Nightshade yet. Happy reading!